An ancient natural breed, the Turkish Angora is a stunning cat with a long and silky coat. They are an energetic, outgoing and friendly breed of cat who gets along well with children and other pets. Their silken coat requires a weekly groom to keep it tangle free. “They are not new to us, being mentioned by writers nearly a hundred years ago, if not more. I well remember white specimens of uncommon size on sale in Leadenhall Market, more than forty years since; the price usually was five guineas, though some of the rare excellence would realise double that sum”. Overshadowed by the Persian cat in the early 20th century, the breed almost vanished. However, wanting to preserve Turkey’s “national treasure” the Ankara zoo established a breeding programme to save the breed from extinction. 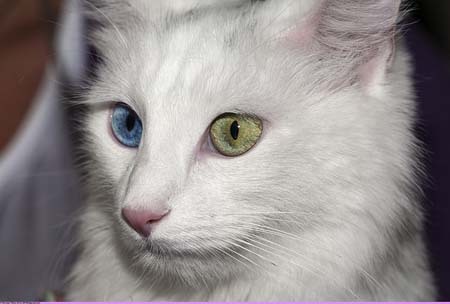 They collected specimens of Turkish Angora cats and concentrated on breeding white cats with odd eyes, blue or amber. After 45 years of being quietly bred at the zoo, the breed was re-discovered by American servicemen, and in 1962, Colonel and Mrs Walter Grant imported the first pair of Turkish Angoras from Ankara Zoo. This pair, an odd-eyed male named Yildiz and an amber-eyed female named Yildizcek were to become the foundation of the breed in the USA. The Grants imported two more Turkish Angoras in 1966. 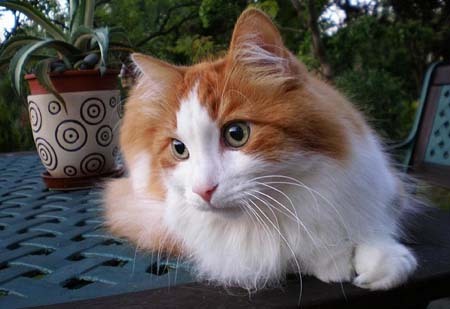 The breed was accepted for registration with the CFA in 1968 and the 1970s the breed found its way to Europe where it had once been so popular among cat fanciers. All Turkish Angoras must be able to trace their ancestry back to Turkey. Strong and muscular cat but light and elegant at the same time with fine bone structure. The hind legs are a little longer than the forelegs with small, round paws and tufts between the toes. Wedge-shaped head and small to medium, in proportion to the body. Large, tufted ears sit high on the head. The eyes are almond shaped and large and come in blue, amber or blue and amber (odd-eyed). The nose is medium length and slightly concave. The coat is semi-long, close lying and extremely fine. The Turkish Angoras have a beautiful plumed tail, a mane, and knickerbockers. The traditional colour is white, but all colours and patterns are accepted. 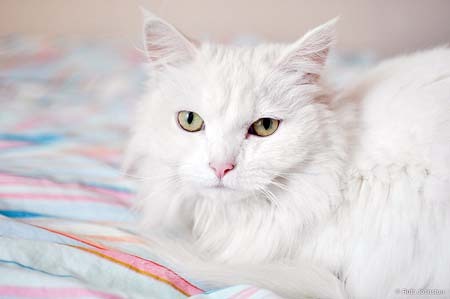 Sociable, sweet and gentle all describe the Turkish Angora. They are quite an energetic breed of cat and extremely curious, who need to check out anything new that comes into the house. Turkish Angoras thrive on human companionship and often form a strong attachment to one person in the household. An intelligent breed who are easy to train to walk on a lead or play fetch with their human family. Due to the fine texture of the coat, it is not prone to matting and brush once a week should be enough to remove any loose hairs. Can You Pick Up A Cat By The Scruff?